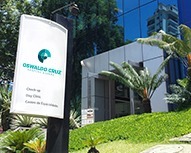 The International Relations Department of the Oswaldo Cruz German Hospital is prepared to receive foreign patients who are in transit in our country. Our expert staff provides an interface between the hospital, patient, and insurance company, providing help with administrative matters and assistance as well as providing support for patient’s families and sharing accurate information about medical care. Clinical staff is also prepared to assist and to share clear information about health conditions. For maximum comfort and care during their stay at the hospital, foreign patients can also count on bilingual nurses and doctors. Interface with international health insurance plans which we have agreements with. Interface with international health insurance plans we do not have agreements with in order to create specific agreements for direct payment. Assistance in scheduling medical appointments and examinations. Assistance via concierge and hospitality information. Guidance on payment and financing policies. Assistance with specialist recommendations in a variety of areas. Assistance in the process of international medical transfers.